Okay friends, it's getting close to that time of year again! The time when the clock ticks by so slowly, the calendar fills up with events and the overwhelming pressure to teach before those final tests and assessments really hits home.... it's the END OF THE YEAR!! 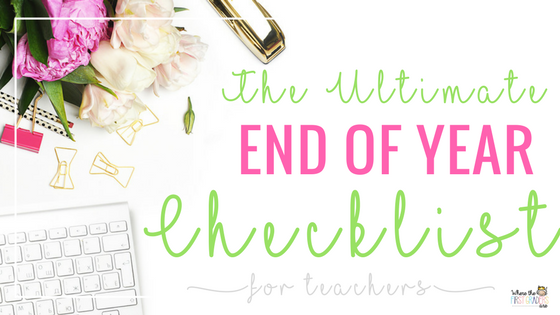 So, while we all know that teachers hit survival mode around mid-April, I have the one and only checklist you will ever need to make sure that you finish up the year with absolutely no loose ends. 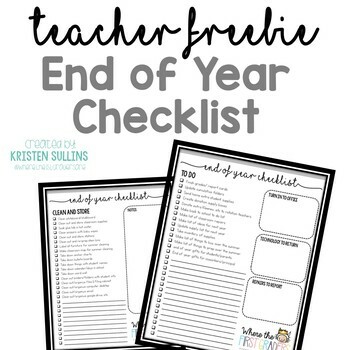 This is seriously the only end of year checklist you will ever need and it's YOURS for free!! It includes a generic list of things to do, things to clean, things to store and put away, things your students can help you do, things to turn in to the office, a checklist of technology, a checklist for your classroom library AND SO MUCH MORE! Simply sign up below to receive the only end of year checklist you will ever need! -Break large tasks into small chunks. -Don't try to do it all at once, pick 2-3 things a day that you want to accomplish. -Highlight the priority items and try to finish those first. -Delegate as much as possible to your students. -Purge as much as possible, I promise it will make you feel better! -Give yourself a break, you've been teaching tiny humans and you are mentally, emotionally and physically tired. Go reward yourself, it will all get done!